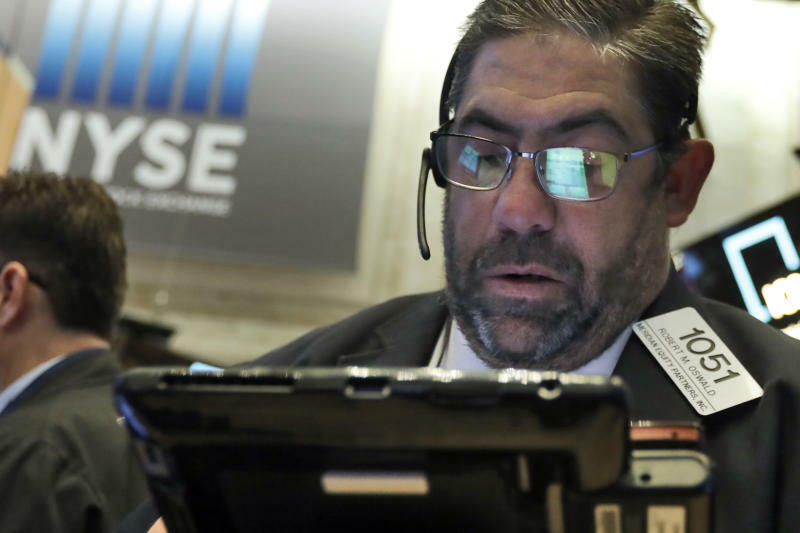 NEW YORK (AP) -- U.S. stocks gave up an early rally Friday and struggled to another mixed finish as investors continued to sell former favorites like retailers. Household goods makers rose again as a week of choppy trading concluded. Stocks surged in early trading after better-than-expected reports from companies including Procter & Gamble, American Express and PayPal. Procter & Gamble, the world's largest consumer products maker, had its biggest rally in 10 years. But the gains for indexes faded after a report showed U.S. home sales fell for the sixth month in a row. That hurt smaller and more U.S.-focused companies. "We don't see too many other yellow or red flags right now, but (housing is) certainly one of them," said Mona Mahajan, U.S. investment strategist for Allianz Global Investors. Mahajan said that company earnings aren't doing much for the stock market right now because investors know the next two quarters should be strong, and they're concerned that growth in 2019 will be worse than expected. Tuesday was the best gain in six months for U.S. stocks, but the S&P 500 fell every other day this week and ended the week up just 0.02 percent. That was good enough to end a three-week run of losses, but most of the market's recent gains have been swiftly followed by declines. The S&P 500 hasn't risen two days in a row since Sept. 20. It finished at a record high that day, which was the last in a three-day string of gains. The benchmark index is down 5.6 percent since then. China said economic growth sank to a post-financial crisis low of 6.5 percent in the third quarter. Chinese finance officials launched a media blitz to shore up confidence in the country's sagging stock market. China's economy has gradually slowed for years, even before a trade dispute between Beijing and U.S. President Donald Trump led to higher tariffs. The Chinese government tightened controls on lending last year to rein in a debt boom, but that, too, has affected the economy. Hong Kong's Hang Seng rose 0.4 percent Seoul's Kospi added 0.4 percent. Tokyo's Nikkei 225 shed 0.6 percent. Germany's DAX lost 0.3 percent and France's CAC 40 sank 0.6 percent. London's FTSE 100 gained 0.3 percent and the FTSE MIB was little changed. Tensions between European Union officials and Italy's new government sent Italian stocks and government bond prices lower Thursday. Italian bond prices turned higher Friday and yields slipped.